LBSU Athletics Director Andy Fee. Photo courtesy of Long Beach State University. The Long Beach State athletic department has heard it from all sides concerning the phase out of former 49ers mascot Prospector Pete, and now the university is asking for all sides to solve the issue. LBSU President Jane Close Conoley and other university officials are officially opening the search for a new mascot, and are taking submissions from students, alumni, faculty, staff and community members. After the submissions are reviewed by committees from different parts of the campus, the Associated Students, Inc. (ASI) will post the finalists online for a vote open to the community. A three-day campus-wide vote for students from May 6-8 will send one nominee to Conoley, who will have the final say. Submissions are being accepted from Monday, Feb. 11, at 8 a.m. through March 8, and the new mascot is expected to make its debut next spring. There are unique concerns about this issue from people all around the city. Long Beach Poly High alum and LBSU student athlete Imani McDonald said she wants to make sure this is taken seriously. “I think it’s important to find something that everyone can get behind and support, especially the student athletes,” said McDonald who serves as an ASI Senator At-Large. 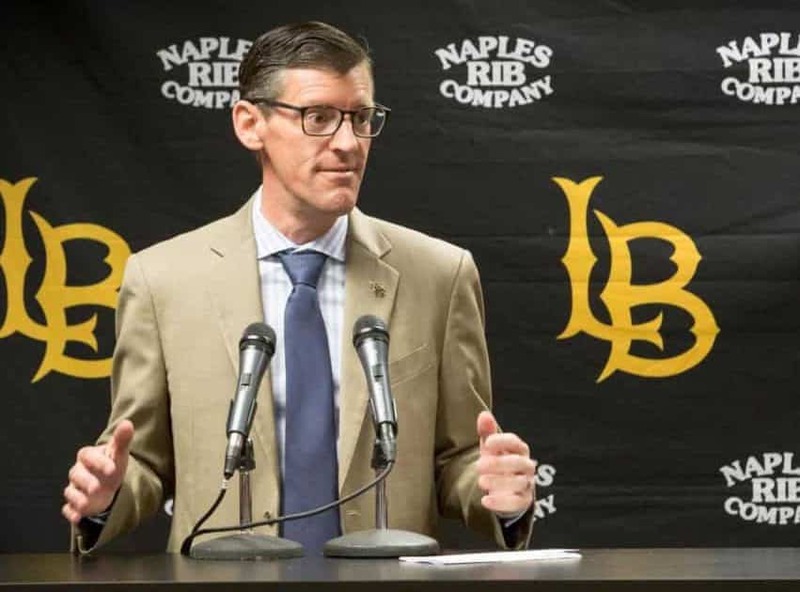 This week we sat down with LBSU Athletics Director Andy Fee to talk about this issue and how his department feels about getting a new mascot. What concerns have you heard from alumni and donors? I know it’s a contentious process for some. We’ve got folks who love the 49ers, and that will always be here. We’re not the thought police. And you can still call yourself a 49er. We’re getting a new official mascot in this process, but like the Dirtbags will still be the Dirtbags. That’s not changing. Would you call this a serious issue for the department? This is serious, but in the realm of seriousness, I don’t want to make too much out of it. We have food and housing insecurity issues with some student athletes, and those are real problems. The mascot is a big deal, but I don’t want to make too much out of it, and I don’t want our fans to lose sleep over it. What about the BE/\CH logo you debuted last year? I’ve talked to (Conoley) about this and we are The BE/\CH. If we’re going to have a new mascot it needs to align with the beach and our values as a university. Could you see in the future the new mascot name replacing the BE/\CH on uniforms? We will have a new mascot, but we have clearly branded ourselves as The BE/\CH and that is the name that resonates. A new mascot can be at games, and maybe we have an alternate jersey that might have the mascot on it. I don’t know. It will be at least a year-long process. This isn’t something that will be flipped overnight. Whatever is chosen as the mascot, we will spend a year creating the identity. What does it really look like? What are its characteristics? How does it really fit into our university? Regardless of what it says on a jersey, who is in those jerseys is the most important thing.